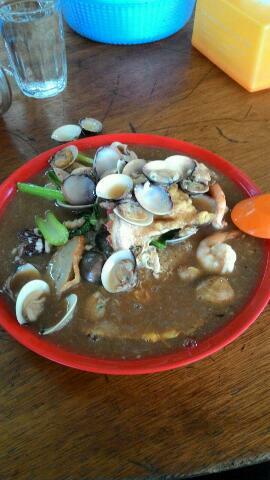 I was amazed to see this serving of seafood meehoon. It is very different from the normal seafood meehoon that we had in KK. Photos were taken by my brother who had this in Tawau this morning. I believed, he too was amazed with it and whatsapp a picture to us before he started enjoying it. 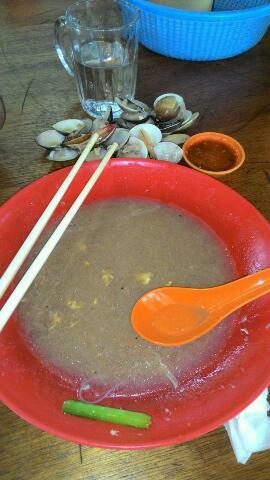 I reminded him of the cholesterol but he did not hesitate a bit..minutes later he sent us a whatsapps showing a photo that he has polished off all the seafood and meehoon...very cheap, it is only RM7.50 per bowl. Tawau, at the east coast of Sabah, is a place with aplenty of fresh seafood..I have been to Tawau once by road many years ago, it took us at least 8 hours to reach there from the west coast (Kota Kinabalu) to east coast, I would prefer to take a plane there for my next trip because I could not stand the long hours by road. So delicious looking plate of seafood! I too would not hesitate to polish off the whole dish! Slurps! Looks so delish! And it's very cheap too given that it has so much seafood!